Ministoeb Comfortable Eyes Masks Help Sleep And Eye Fatigue, Super Soft, Ultra-smooth Silk Permeability, Soothing Mask Calm And Relax. True Skin Care Is Not Allergic Goggles, No Pressure Goggles, Ice Pack Can Be Installed Hot And Cold Coated Eye (not Including Ice Bag). Easy To Adjust The Headband Will Not Tangled Hair Like A Mask, And A Plastic Regulator To Stay On Your Head, Fully Adjustable Shoulder Strap From 15.8 Inches To 27.6 Inches For Men / Women / Children. Whether At Home, At Home, In The Hotel Or On The Plane (where Bright Light And Dry Air Can Be Particularly Severe), Can Get The Full Power Outage Benefits. Perfect Travel Accessories To Help You Perfect Sleep Rest. 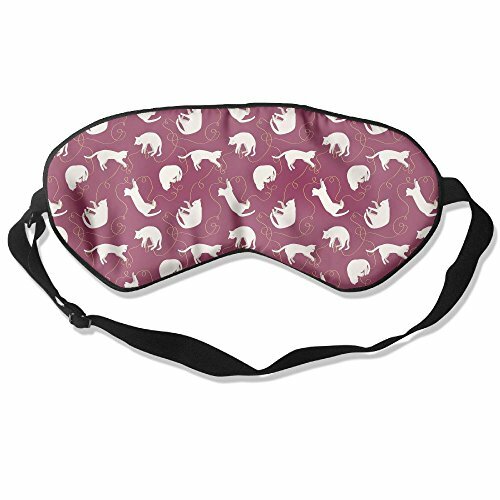 A Unique Gift For Anyone Who Wants Deep, Uninterrupted Sleep. Personalized Fashion Patterns To Your Loved Ones, They Will Really Use And Cherish The Gifts. As Different Computers Display Colors Differently, The Color Of The Actual Item May Vary Slightly From The Above Images. The Final Color With The Actual Commodity Prevail. Hope You Can Understand.